What began as an obscure duo (Bill & Bo) playing mostly for fun at small coffeehouses and local restaurants has evolved into what many are calling the best trio in the Golden Isles. This popular group performs a myriad of pop and folk-type cover tunes from the 60’s and 70’s, specializing in two and three part harmonies in the style of the Everly Brothers, Simon and Garfunkel, the Beatles and Crosby, Stills & Nash. They play several Jimmy Buffett and Bob Dylan tunes as well, and they throw in some songs made popular by Linda Ronstadt, Creedence Clearwater Revival, and many others. The group features solid musicianship with an emphasis on tight vocal harmonies and many years of musical experience. Bill has been performing professionally for over 30 years, and Bo has been playing for over 45 years. Marie, who joined the group about a year ago, has been playing professionally for over 15 years and has become a real focal point for their performances. With her awesome bongo playing, stellar vocals and an arsenal of percussion instruments she keeps the audience wondering what she’ll do next. This band is just plain fun to watch as well as hear! They play songs that you grew up with, tunes that bring back memories for most of their audience. Bo is also a songwriter, working on some original tunes that will (hopefully) appear on an upcoming CD this year. Bill also writes a weekly internet newsletter called the “Golden Isles Music Scene”, which tells local subscribers where and when they can find live music in and around the Golden Isles. His goal is to promote live music to the local folks who will appreciate and support it. It’s a free service, available through email… if you’d like to subscribe, just send an email request to Bill Townsend at elaineandbill@bellsouth.net and he will add you to his growing database, now estimated at over 500 local music lovers. 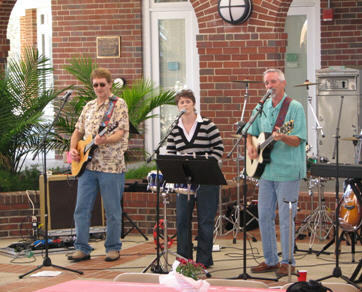 They are currently the “house band” every Thursday night at the Village Inn & Pub, and they have played for several functions on Sea Island as well as other local restaurants and country clubs. They have also played for other private events as well, including wedding rehearsal dinners, reunions and some fundraisers. Visit their website at: http://www.threeofus.coastalviewpoint.com.